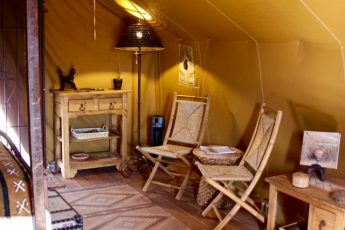 A VERY UNIQUE GLAMPING EXPERIENCE! 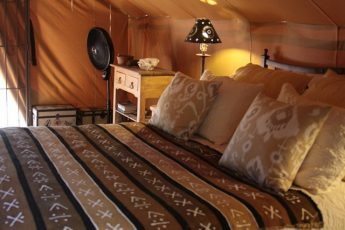 Choosing quality over quantity we have only 2 luxury tent sites in our Safari Tented Camp – Jaguar Camp and Ocelot Camp. 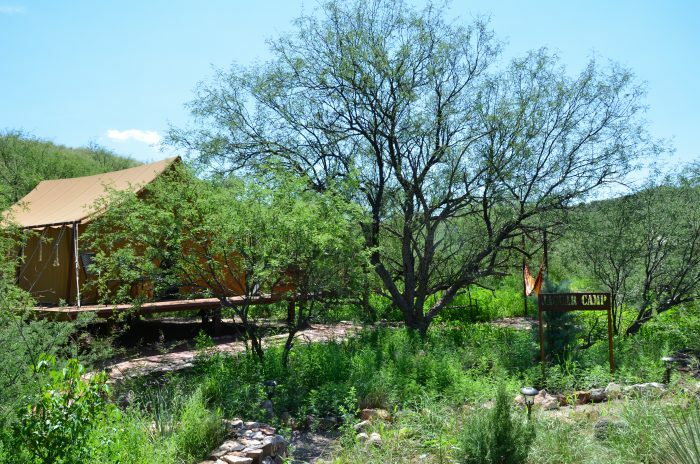 Nestled amongst the Mesquite Bosque or Woodland, our camp is exclusive and guests will never see other tourists on the property. 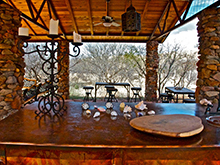 Jaguar Camp and Ocelot Camp have been built with privacy and views foremost in mind. 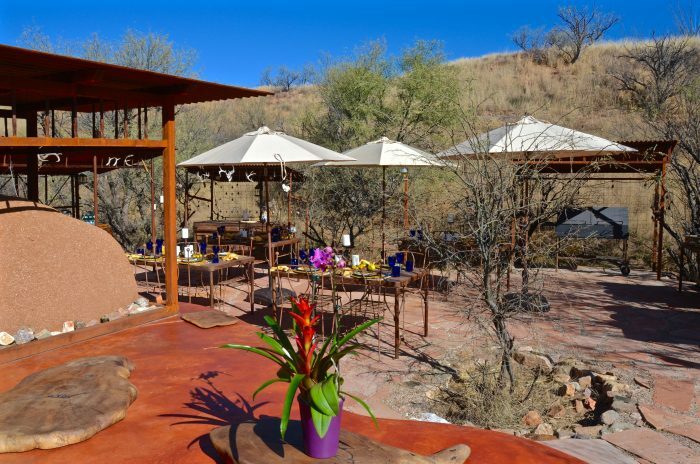 In this ultimate wilderness experience, guests listen to birds, search for wildlife at Raven’s Nest Nature Sanctuary, and tap into the timeless rhythms of Nature. 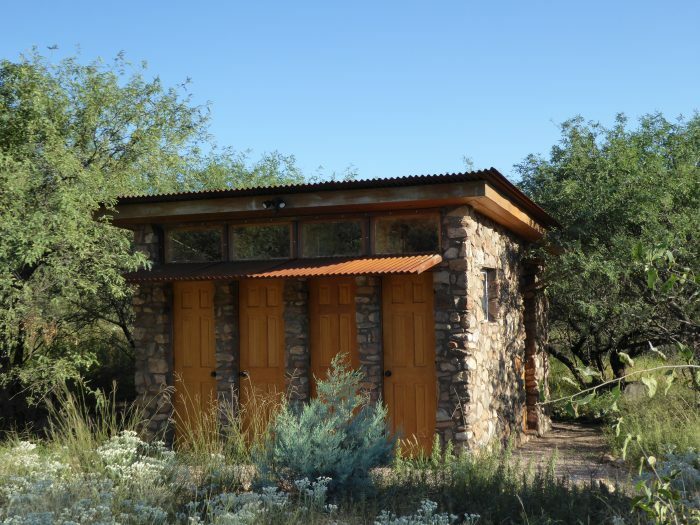 Whether it is the haunting call of a Gray Hawk, the raucous cacophony of cavorting Ravens, or the iconic songs of the Coyotes at dawn and dusk just a short distance from your bed, you’ll immerse in Nature as never before. 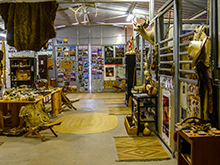 Jaguar and Ocelot Camps have been designed with your relaxation in and enjoyment of Nature as the driving factors. 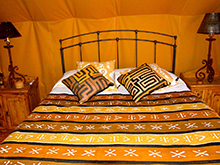 Each secluded Glamping site is well-endowed with a spacious, mustard-yellow canvas tent set atop an ample and attractive Fir wood platform. 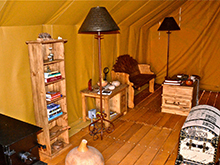 Generous tent dimensions are 20 feet long by 14 feet wide by 10 feet high at the center. 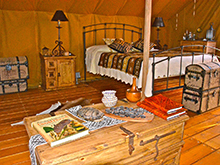 Retractable stairways at either end help ensure that the local wildlife and you meet only outside of the tent! 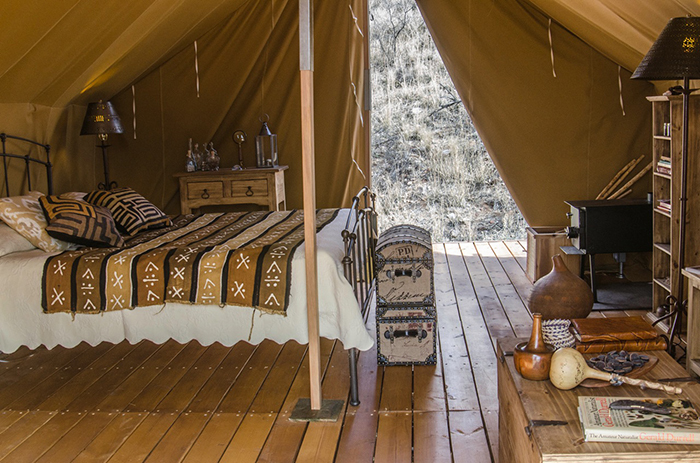 Both ends of your tent have screen doors that open to the fresh air, allowing you to regulate the inside temperature while keeping any insects a bay . 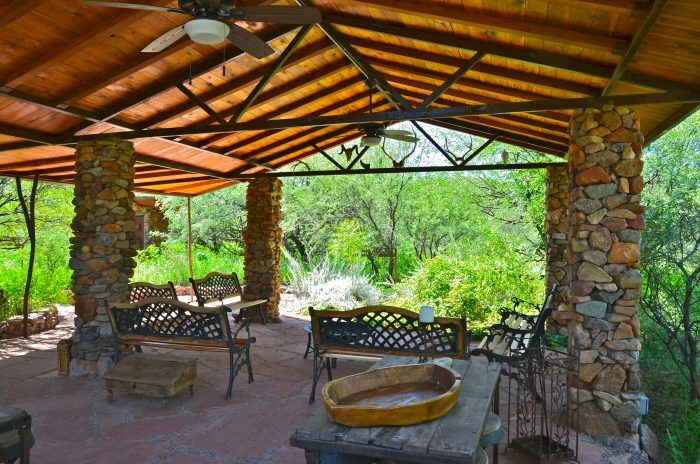 A dedicated outdoor deck area is the perfect spot for you to relax with a good book, watching the local wildlife. 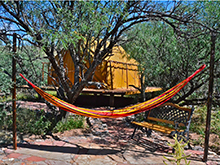 To the side of your luxury Safari Tent there is a hammock for lounging and a comfortable bench under the shade of mature mesquite trees. 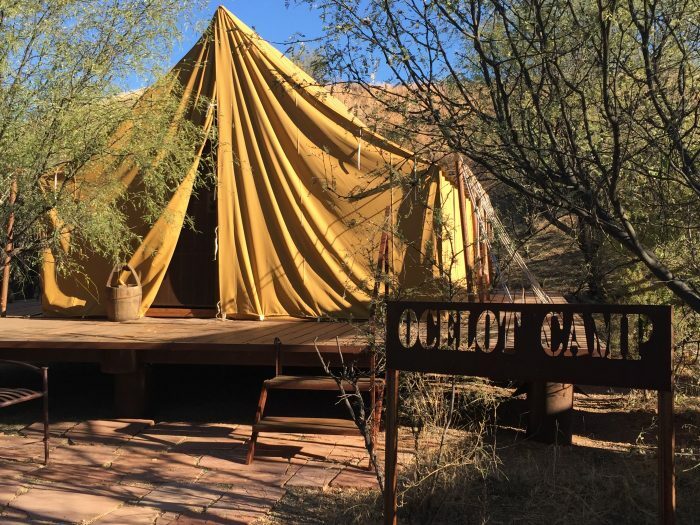 Jaguar Camp and Ocelot Camp have amazing amenities, including a supremely comfortable sleep number bed, 100% cotton linen, large soft bath towels, a luxurious outdoor shower, and cooling fans. 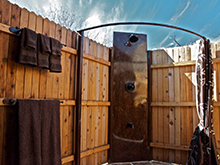 This unique lodging experience will allow you to disconnect from the hectic urban life styles and immerse in the natural world while enjoying plenty of modern comforts. 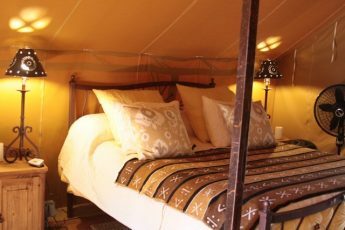 At Raven’s Nest Nature Sanctuary we are delighted to offer our guests the opportunity to enjoy the privacy and luxury of our African – style Safari Tented Camp. 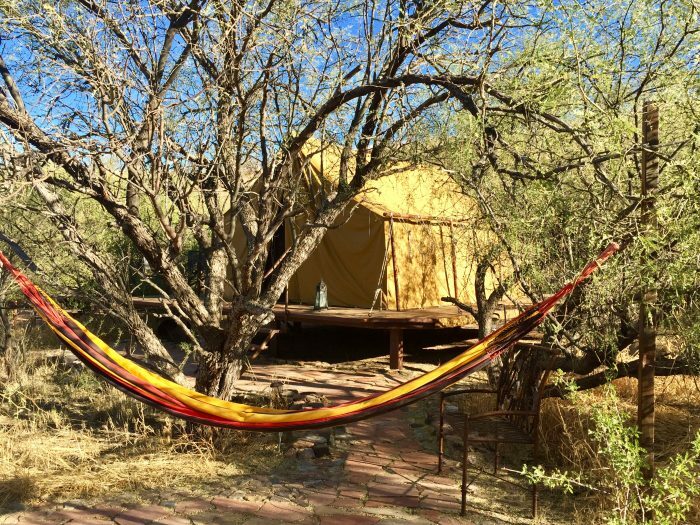 Inspired by our month long trip to Botswana and our 2 week experience at a Safari Tented Camp, we decided to emulate the concept, upgrading all the facilities and amenities. 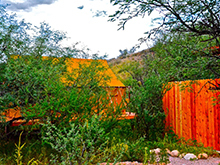 Given our passion and commitment to protect our scarce natural resources, we designed and built ours using a strict Ecological template. 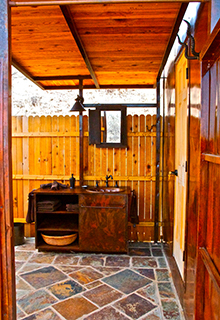 By the back end of each Safari Tented Camp guests will enjoy an enclosed private bathroom area with hot and cold al fresco shower. 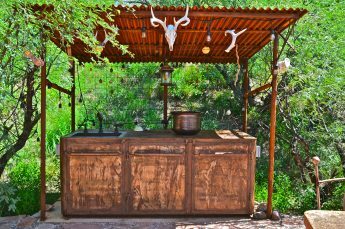 At our Eco-Loge we are very grateful to have a wonderful well with delicious water that feeds all our Gray Outdoor and Indoor showers and sinks. 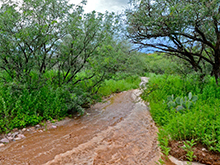 We are thrilled to be able to gift the used water back to the Earth via a Gray system that delivers it to the neighboring trees and shrubs. 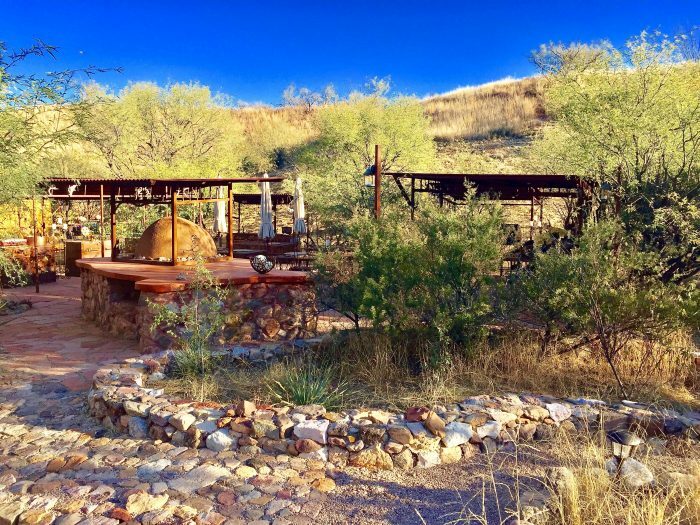 Our guests are excited to participate in this ecologically minded and sustainable process every time they use our well water at Raven’s Nest Nature Sanctuary. 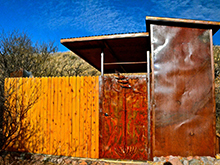 Inside your private En-suite bathroom you will enjoy a unique experience while showering under the glorious Arizona sun or under the stars with hot water on demand. 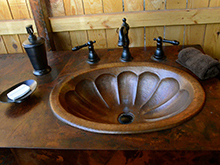 The hand-made bathroom vanity includes copper sinks and rubbed oil bronze fixtures. 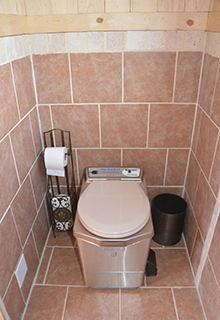 Incinerator toilets ensure a hygienic and efficient waste disposal system. 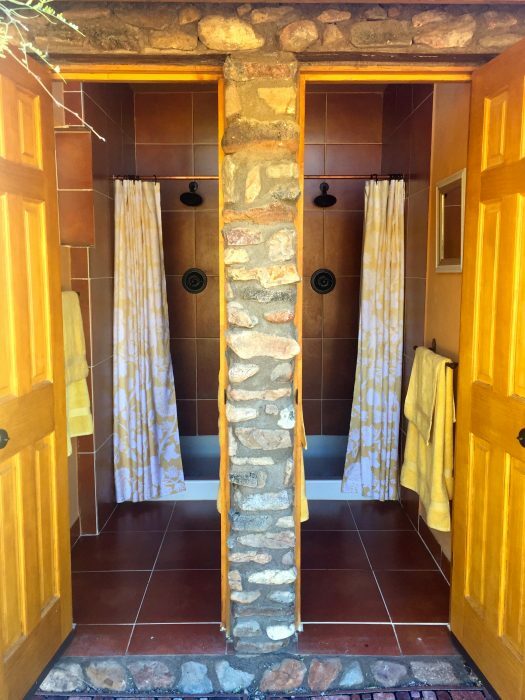 For guests who would like to also enjoy an indoor hot shower, 4 luxurious indoor showers await at Main Camp at the beautiful Nook. 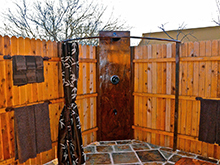 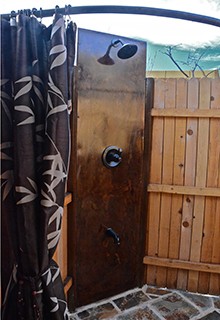 The strategic location of these 4 Gray Indoor showers, allows the used water to be delivered to all the native trees, shrubs, and wild life ponds located by the Sky Islands Discovery Center. 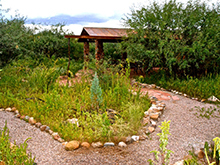 The transformation of this natural area due to the gift of the used water has been one of our most rewarding Earth Stewardship projects at Raven’s Nest Nature Sanctuary. 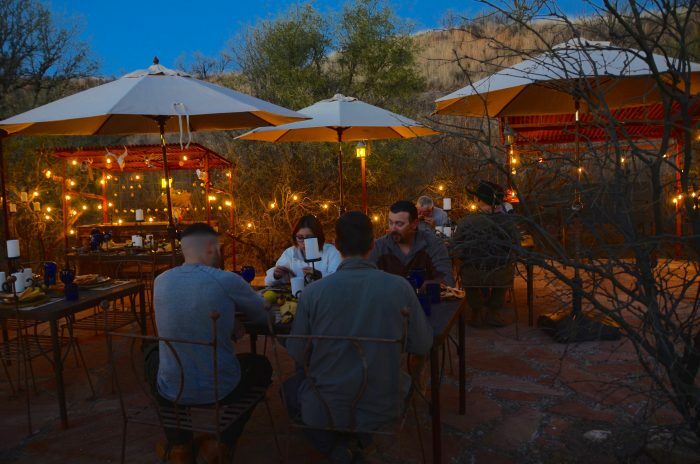 Conveniently situated near Jaguar and Ocelot Camps are both outdoor and indoor dining and lounging areas. 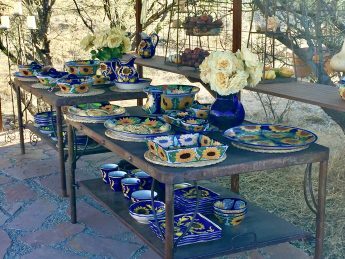 Catclaw Lounge is a beautiful flagstone patio set under the Arizona blue sky – ideal for soaking up the warm Winter sun, while savoring a delicious, home-cooked meal. 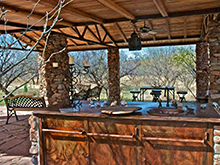 You may also enjoy breakfast and dinner at Catclaw, allowing for wildlife viewing as you eat. 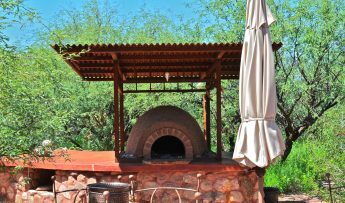 A beautiful clay horno, or outdoor clay oven – made with the clay and grass from Raven’s Nest Nature Sanctuary adjoins Catclaw Lounge, making for delicious baked goods for dinner. 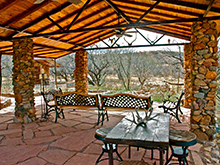 Our covered dining area is aptly named the Lion’s Den, as Mountain Lions have been recorded nearby. 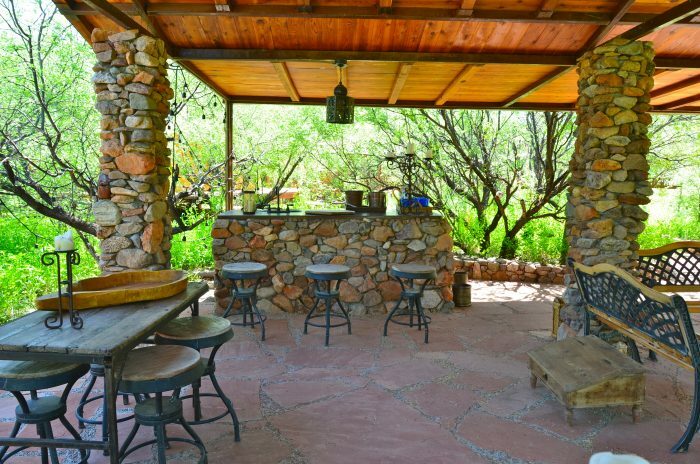 There, at Coati Cafe organic smoothies, organic teas, and other delightful beverages will slake your thirst and healthy snacks assuage your appetite during the day. 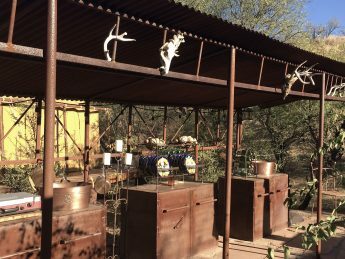 The tranquil sounds of a small waterfall at Pyrrhuloxia Pools – named after our second Cardinal species – provide the perfect relaxing atmosphere for the Lion’s Den and attract countless birds. 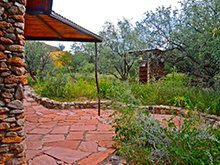 A mere stroll away is our outdoor reading area, Hummingbird Haven, harboring a fine selection of Nature/Outdoor books and magazines. 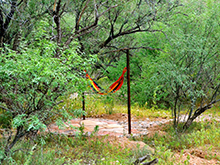 Radiating out from the Safari Camp is a network of mystery-filled Nature Trails totaling several miles and encompassing both lowlands and highlands, arroyos and canyons. 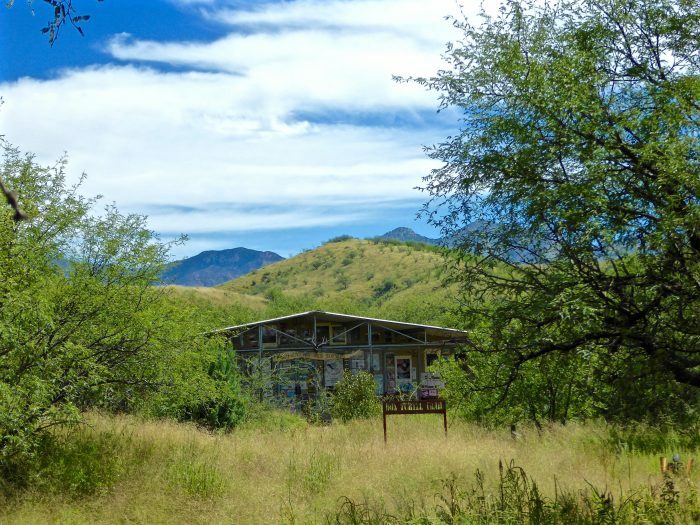 A relaxed saunter along the Woodlands and Grasslands of these trails is sure to net you a wide range of memorable wildlife sightings. 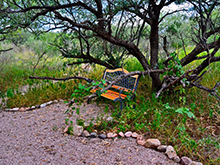 Several strategically placed benches and shade ramadas plus a detailed map will facilitate your explorations. 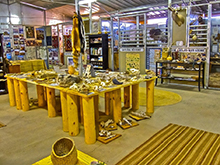 Be sure to stop at our Stone-age Village, Organic Orchard, and Lizard Labyrinth along the way! 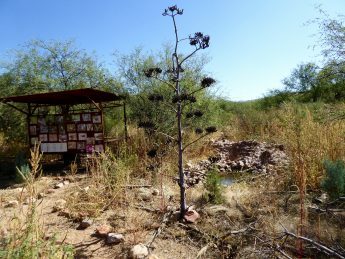 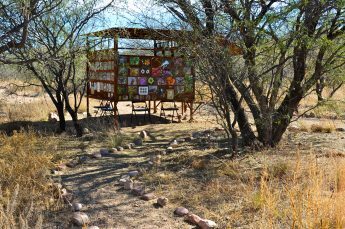 Close to your camp is our Sky Islands Discovery Center – filled with a wealth of knowledge about the nature of southeast Arizona and beyond. 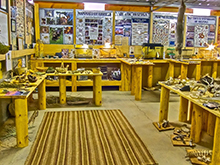 There you can check out our full Nature Library, peruse a multitude of informative and fun displays, explore our Organic Gardens, and learn from our live wildlife displays. 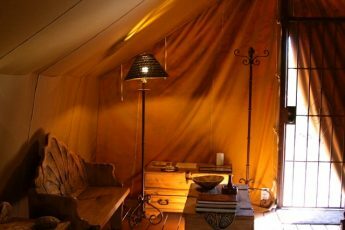 You are welcome to bring your laptop to write that book you have been working on as there are plenty of standard American outlets for your use inside your tent. 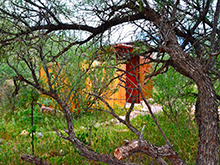 Due to our fragile Eco-system, we ask that you use our biodegradable products provided or bring only biodegradable soap, shampoo and conditioner.